In Part 2 we discussed and walked through how to configure the Sonus SBC system settings including networking, security and other system dependencies. In this article we will be configuring Skype for Business to use the Sonus SBC as an appropriate gateway to the PSTN for Enterprise Voice. To begin with we will be making the connection using unencrypted TCP connections to make it simple. TLS trunk configuration will come in a later article that will cover some common advanced configurations and settings. 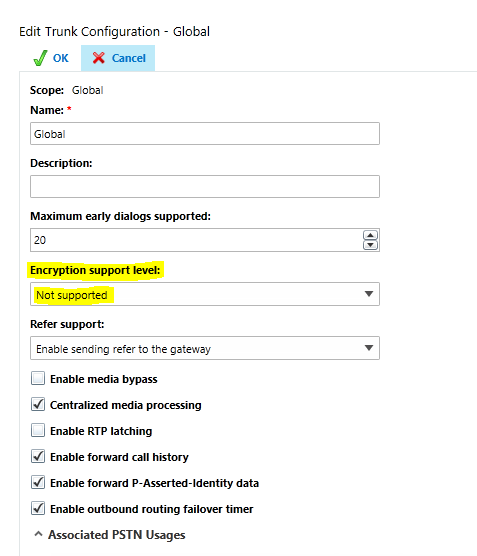 As part of this article we will setup the gateway and trunk inside Skype for Business, create a simple dial plan and voice policy and assign a user a DDI so that we can test inbound and outbound calling later on. Please excuse the briefness of some topics as this article assumes a level of competency with Skype for Business. Firstly, please make sure that you have a DNS record configured for your Sonus SBC in your internal DNS zone. This record is a simple “A” or pointer record to the SBC IP. Alternatively, an IP address of the SBC can be used instead of the FQDN for TCP connectivity. In order to make Skype for Business aware of the Sonus SBC, we need to add it to the topology. Normalization Rules – These are regex patterns that match a user inputted number string. These are necessary to convert a user vanity number into a valid E.164 number e.g. +441270892000 instead of 01270892000. The reason for this conformity is to ensure called numbers can be interpreted across multiple PSTN gateways to ensure the correct destination is dialled. Simply passing user inputted number strings introduce a level of uncertainty and make troubleshooting harder. Voice Policy – This can be either global, per site or per user. The Voice Policy dictates the level of access to the PSTN a user is permitted, along with voice features, such as call park, simultaneous ring etc. The restriction on dialled numbers is governed by the PSTN Usage Policies assigned to the voice policy. PSTN Usage Policy – The PSTN usage policy dictates which voice route a user can use to make a call based on a particular number string dialled. Each PSTN usage policy is matched to a voice route. Voice Route – The voice route is used to match a dialled number to a valid gateway to the PSTN. This might be the same gateway as all the other routes, or may be different especially for multi-national companies with gateways around the world taking benefit of least cost routing (where legal of course). The voice route looks at the start of the dialled number and if a match is found, the call is processed through this route. If the number dialled by the user cannot be normalized, or a voice route is not configured to allow the normalized pattern, the call will not be able to processed to the gateway. Now we need to create a normalization rule or two in order to convert number strings into E.164 standardized numbers. If you want to learn about normalization rules, I blogged about this a while ago and I suggest you read if you’re not up to speed in this area yet. Press OK to add the normalization rule to the dial plan. Please note, changes will not come into effect until the dial plan has been committed. Repeat the process for other number strings. The above is a simple example, don’t forget the UK Emergency Services! A note to bear in mind. The normalization rules are processed top to bottom. If a number string matches a pattern expression in rule 1, it does not look any further and will not match against subsequent rules. Next we need to create a voice policy. Typically, you would create various depending on the level of access you want to grant users. For instance, the global voice policy should only contain the least amount of privileges e.g. Emergency number dialling (E911). User Policies should then be created for various steps e.g. Internal Only, National, International, Premium etc. The UI is not intuitive here, to create the PSTN usage you must create via a Voice Policy. A Voice Route can only be created if there is a PSTN usage. Therefore, all these are usually created during the voice policy configuration. Repeat for any other policies, or add more PSTN usages, routes etc. until your policy is configured as you want. Now we have the route and policies defined, we need to make some changes to the trunk configuration to support TCP and unencrypted media. Leave all other settings as they are. Restart the mediation service to bring this change into immediate effect, or if not possible due to use, wait approximately 5 minutes for the next mediation configuration refresh. Note, you can apply different trunk configurations to different PSTN usages if you require. I.e you can allow TCP connections to other internal legacy PBXs systems, but enforce encryption to the SBC. The last item we need to perform on Skype for Business is to assign a DDI to a user. Edit the user properties and change their telephony type to enterprise voice. Assign them a Line URI in the format of tel:<E1.64 number> e.g. tel:+441270892000. If you want to include extension dialling append the following ;ext=<extension> e.g. tel:+441270892000;ext=2000. Finally, select the required voice policy and press OK to commit the change. We now have a very basic configuration within Skype for Business that will allow for a user to make and receive a call to the UK PSTN, subject to Sonus configuration (of course). In Part 4 we will discuss and walkthrough how to create the SIP trunk to Skype for Business, setup call routing tables and establish a phone call. Thanks for the efforts in making this article. Great articles Mark, thanks very much. One question – I notice you mentioned being able to use Media Bypass on the first part but have left it unchecked here in Part 3. Is it something you’d recommend setting if the SBC has a port on the LAN or does it rely on e.g. the SIP provider supporting it? Media bypass is something that depends on the environment. I called it out, just to show that it is possible, rather than advising it to be the recommended approach. Enabling media bypass is something you can do in some circumstances. The internal endpoints must all be able to reach the SBC without having to go via any proxy servers including the Edge server in an ideal world. And in doing so will lighten the load placed on the mediation server. However, the most important thing to note about using media bypass is that the endpoint must support the supported codecs on the SBC i.e. G.711a/u G.722 and G.729. 99.999% of devices will. The other thing to consider is while the Skype client will prefer to use SILK it will negotiate G.711 in SDP. If you can neg the codec between the internal trunk and the trunk to your ITSP to be the same e.g. G.711 then the Sonus SBC will not need to perform any transcoding and therefore will be able to handle a higher call volume. If you have desk phones then these will prefer RTAudio if LPE or G.722 and then G.729 before G.711 for 3PIP, so to get this to match you may need to alter the codec preference.